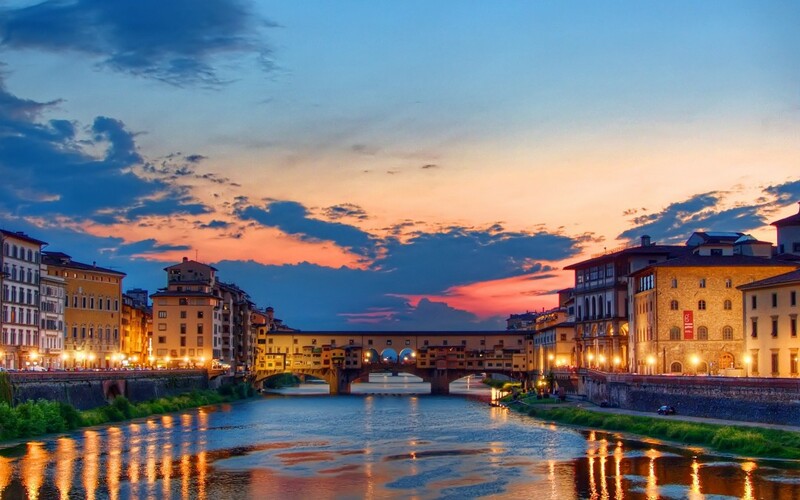 The Tuscan city Florence combines history, art and culture and fascinates with its Italian ambience. As capital of the wonderful region Tuscany and with its unique historical centre, Florence attracts millions of visitors every year. Yet in the middle ages, the city has been an important place for the European trade and ranked among the richest cities. Apart from this, Florence owes its famous history to its cultural importance: it is known as the cradle of the Renaissance and was home to celebrities like Michelangelo, Galileo Galilei or Leonardo da Vinci. Today, Florence fascinates with an enchanting townscape, a wealth of museums, palaces and monuments as well as its historic old town, which pertains to the UNESCO world heritage. The highlights of the city are the Piazza della Signoria, the Uffizi, palaces like Palazzo Pitti or Palazzo Vecchio as well as the famous Ponte Vecchio and the impressing cathedral Santa Maria del Fiore. A guided tour through Florence offers the perfect opportunity to discover the most beautiful spots of the Tuscan capital. Guided city tours through Florence are the perfect choice for impressing incentives. A tour through the multifaceted town will be an absolutely unique experience for your employees. Apart from city tours there are many other incentive opportunities like oldtimer or wine tasting tours in Tuscany, which turn Florence and its surroundings into the perfect MICE destination. Amazing event locations for the evening offer a great possibility to round off an exciting day in Tuscany. At an event in an antique palace or on a fantastic terrace overlooking the river Arno, your employees will be able to end the day in a relaxed atmosphere before heading back to the hotel. Also for this, Florence has to offer a variety of classy locations. However, it is not only touristic attractions or unique event locations, which attract visitors to the city – also the multitude of exhibitions and congresses makes a substantial contribution. International fairs with renowned exhibitors take place in Florence all year long, above all famous fashion fairs like the Pitti Immagine Uomo where famous designers like Bugatti or Lacoste are presenting their latest collections. In the south, Florence is bordered on the Chianti hills – hence the perfect starting position to discover the amazing landscape. Be it a congress or employee event; a teambuilding, golf incentive or wine tasting tour – your employees will be thrilled for sure!